How Do I Know If My Yorkie Is in Labor? For the tiny Yorkshire terrier, pregnancy, labor and birth can be a scary, confusing time. If your Yorkie is pregnant and approaching the end of her gestational period, knowing the signs of labor allows you to give her comfort and care during these events. If you can tell that your dog is in labor, you can keep a close eye on her, and watch for the arrival of puppies and any potential emergency situations. Take your Yorkie's temperature with a rectal thermometer. A temperature below 100 degrees Fahrenheit means your dog will go into labor within the next 24 hours. Monitor your dog for signs of discomfort, including pacing, shivering, and panting, which occur when your Yorkie's cervix begins to dilate and contractions begin. Monitor your dog for stomach upset. If your Yorkie refuses food or begins vomiting, she is in the beginning stage of labor. Watch your Yorkie for "nesting" behavior, where she will nudge blankets around to create a nest for the birth process. Listen for persistent whining or whimpering. The feeling of contractions and labor can be frightening for your dog, and she may make sounds to show her anxiety. 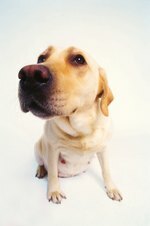 Watch for a tan colored liquid to pass from your dog's vaginal opening. This occurs when the placental water sack breaks, which occurs during labor, soon before the puppies are born.